For Ron and Ronni, service work in the neediest areas of the world is a spiritual calling. Throughout their lives together, they have channeled their compassion and devoted their time and talents to medical missions around the globe. 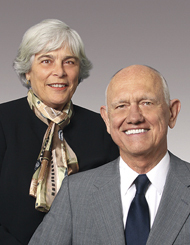 The couple met in 1960 and married in 1962 while Ron was studying at the School of Dentistry. "Both of us had what my mother called 'ants in our pants,’” Ronni says, referring to their desire to do mission work. In 1968, during his residency in pediatric dentistry, Ron found their first opportunity through the Catholic Medical Mission Board. With their three young sons in tow, Ron and Ronni headed to Malawi to help set up a hospital dental clinic. It was there that the fourth of their seven children was born. Two years later, they returned to Milwaukee. Ron joined the Marquette Dental School faculty full time, and Ronni began working on her nursing degree. Every seven years, they would leverage Ron's sabbaticals to travel to places like Brazil and Uganda to help provide basic dental care. In the mid-1990s, the Pruhs began focusing on Haiti, traveling at least annually to provide pediatric dental care in an orphanage. They eventually established a dental clinic at St. Damien's Children's Hospital near Port au Prince. Their sons, Matt, Dent '99; David, Law '91; and Martin, Comm '92, Law '95; now also make annual trips to Haiti. Although their more recent trips have presented some challenges for this couple in their mid-70s, the Pruhs recently returned from Haiti in early February. They transported a year's worth of supplies for the St. Damien's clinic and screened 450 children in the orphanage, referring those needing dental treatment to the clinic.